As PC gaming increases in popularity, more and more people are choosing building their PC over purchasing a pre-built machine. Building your PC helps you save money, and gives you full control over every aspect of your new computer. Not only does building your own PC save you money, but it can also be an enjoyable learning experience that adds an extra level of personalization to your new Machine. People who assemble their new gaming machine themselves get to pick out every component and design their build from the ground up. Picking out the right motherboard, processor, graphics card, and more is vitally important to ensuring you get the best experience, however each of these components will need to be properly protected and cooled by a high-quality case. Everyone who is in the market for a new gaming PC will need a case that matches their vision for their new gaming machine, and that offers enough features and customization options that they can make it their own. We looked at the numerous PC cases built for gaming on the market and picked out the five that are best for users who want to get the most out of their new machine. We started our search for the best gaming cases by looking at those cases made from top quality materials and manufactured by reputable brands. We determined this final list by pouring over user reviews and feature lists as well as taking into account what features are most important in a gaming case. We tailored our list to the gaming cases that will give you the best experience possible. We compared every nuance of each of these cases and weighed each category in order to bring you the five best gaming cases on the market. When it comes to PC Gaming Cases, nothing is more important than proper cooling. Without proper cooling, your new components will be rendered useless by high temperatures, which will also shorten their lifespan. We prioritized gaming cases that allow you the largest range of freedom when it comes to choosing the cooling solution you prefer, while also providing a solid cooling experience out of the box by providing good airflow and high quality fans. Being able to pick between simply air cooling your PC or adding an optional liquid cooling system is an invaluable feature to have that will allow you to keep your case through multiple hardware upgrades. We took into account the number of intakes and exhausts on each of these cases, as well as the sizes of fans supported on each. In addition to air cooling options we made sure to prioritize cases that have support for full and half sized radiators for liquid cooling solutions. Proper cooling is paramount to your gaming experience, as poor cooling in a gaming PC can lead to frame drops and overheating. A good case will keep your components cool even through hour-long gaming sessions. Prioritizing these criteria helped us to make a fully informed comparison of each device and allowed us to decide which cases should make our list. While virtually every case on the market will allow you to have a standard array of components, such as a lone hard drive, a standard size GPU, motherboard, etc., we focused on the cases that go the extra mile and allow you to expand your new gaming build in any way you want. As it becomes increasingly popular to keep your operating system on a Solid-State Drive while relying on a standard hard drive to hold your games, increasingly more cases come with support for several storage options. We gave extra points to those cases that not only allow you to have two storage devices, but that go the extra distance to give you even more flexibility when it comes to storage. When compiling this list, we also gave added focus to cases that allow you to use full size graphics cards with two or more fans. Many PC builders don’t want machines that they’ll tuck away behind a desk or in a cabinet to never see again. Instead, the majority of PC gamers prefer to keep their cases on their desk or in an easily observable place. Keeping your PC out in the open and off the ground has the added benefits of increasing airflow and cutting down on dust, while also allowing people to see your new machine. For the latter reason, we looked at cases that give you good aesthetics and features without compromising on the internal design. Even though we’ve included customizable features in other categories, we focused on cases that allow you to customize your PC in a variety of ways. From removable and replaceable fans, to support for LED’s and removable hard drive cases we’ve included cases that allow you to make your PC your own. We also gave extra points to cases that allow you to choose things like color options for the case, for an added level of customization. We did our best to bring you a list of gaming cases that won’t restrict you, but will instead allow you to build the PC you have always dreamed of. The final area we considered when making this list is broad, however, we were sure to give extra points to those cases that included an extra feature or two that really caught our eye. From innovations in side panels to room for proper cable management, we were sure to take note of eye catching features that are sure to make a new PC build feel like a full upgrade. Our #1 pick for best Gaming Case was the NZXT Phantom 410 . Starting with cooling, this NZXT case offers support for two 120mm front fans, a real 120mm fan, a side 140mm fan, and two top facing 120 or 140mm fans. These fan options along with the 30W 3-step fan control included with the case allows you to quickly customize your PC for silence or performance with the flip of a switch. In addition to air cooling options, the 410 includes support for a full size 240mm dual radiators for water cooling solutions. The expansion options on the 410 are some of the best we’ve seen as it includes support for up to six 3.5” drive bays for an incredibly high amount of storage customization. If storage isn’t your main concern, these drive bays are removable in order to make room for a full length three-fan GPU. The Aesthetics of the 410 are clean and unique. A small side window allows for a glimpse at your internals including your liquid cooling system, and the perforated side is perfect for allowing extra air flow or attaching a side fan for ensuring that your graphics card receives enough air flow. The 410 offers a huge amount of customization in every area including storage and cooling, while also allowing you to add any number of LEDs or LED components you may choose to add. While the NZXT case is a bit lacking in any additional features, the support for a full size radiator as well as numerous customization options was enough to land it at the top of our list. The Corsair Carbide Clear 400C comes in as a close second on our list. For a slightly higher price tag the Carbide offers a unique design packed with features that make it a worthy contender for the best PC case. Starting with cooling, the Carbide comes with support for dual 120mm intake fans, two top facing fans, and a single 120mm exhaust fan. Liquid cooling is where the Carbide shines as it offers support for both CPU and GPU liquid cooling loops, and offers compatibility for a front 360mm radiator, or multiple 120mm or 140mm radiators in order to allow you to customize your liquid cooling system. The Carbide also includes easily accessible dust filters in order to make sure you never have to spend extended periods of time cleaning the dust from your system, and for this it received extra points. For storage solutions, the Carbide allows for a 3.5” bay near the base of the case in order to keep your storage out of sight, however it does not offer as many storage options as the NZXT case. The Aesthetics of the Carbide are among the best on the market. The Carbide sports a hinged full glass side panel that is easy to open, while allowing you a full view of all your components. Its simple front makes it one of the best-looking cases available. The robust liquid cooling options and storage hiding solutions make the Carbide an extremely customizable case. The Carbide packs some additional features in the way of the two modular PSU and 3.5” bay covers it includes, which allow you to clean up your case by tucking all of your unnecessary cables behind them while maintaining a clean and refined look for your PC. For its incredible aesthetic, multiple features, and liquid cooling options, the Corsair Carbide comes in at number two on our list. Coming in at third on our list is the Thermaltake View 27 gaming mid tower case. The Thermaltake offers some of the most robust cooling options we reviewed, with support for triple intake fans, a single exhaust fan, and triple radiator support this case is a natural fit for any liquid cooling enthusiast. In addition to the liquid cooling options, included dust filters make this case perfect for those who don’t want to ever have to worry about their temperatures. Storage expansion options on this case are a bit lacking, as it supports only two storage bays in order to provide extra room for liquid cooling support. The Aesthetics of the View 27 are among the strongest ever made, as its features a unique gull-wing window panel that allows you to view your components from the top, while giving you full view of every aspect of your PC’s interiors. While liquid cooling options are seemingly endless, the View 27 lacks other forms of customization in order to offer the most robust liquid cooling experience out there. The View 27 offers an incredibly well designed head-turning design that offers seemingly endless possibilities for cooling. Despite its lack of other features, the View 27 is well deserving of a spot on this list. 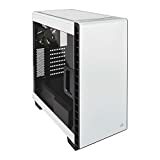 The number four spot on our list goes to an interesting and unique case designed by Rosewill that features high quality tempered glass that surrounds the case on the front and side. The Rosewill case includes four pre-installed fans, with three being placed in the front and one in the back. The case supports 360mm liquid coolers on either the front or top of case, and is sure to keep your temperatures low. This Rosewill case offers carefully hidden HDD trays that allow you to keep your storage options out of sight, at the cost of only having two. The Aesthetics of this case are top notch, as the tempered glass front allows you to see the LEDs of the included front fans, and the tempered glass side panel allows full view of your components. Beyond liquid cooling options, this case does not provide much in the way of customization, however the ability to place LED fans in the tempered glass front panel does allow for a good deal of customization. As far as additional features go, the Rosewill case does provide a massive amount of cable storage, allowing with removable dust filters on the front, top, and bottom of the case. This Rosewill case promises the best airflow on the market, and with a simple yet pleasant design, it offers a solid gaming case experience for a slightly higher price. Rounding out our list of the best gaming cases is the Rosewill Tyrfing case. The Tyrfing is the most affordable case on the list, and while it does lack the flashy designs of the others, it offers a high quality affordable solution for those looking to put as much money as possible into their components. 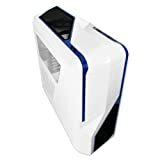 This Rosewill case offers a good amount of airflow, and includes two front facing LED fans and one non-LED exhaust fan. It offers support for three additional fans on the top, and supports liquid cooling radiators to the top and rear. The Aesthetics of this case may not turn any heads, however it offers a simple design that will fit well with any setup. This case offers a lot of customization in the way of cooling, and offers seven expansion slots for plenty of customization. This Rosewill case offers a sizable side panel, and a tried and true design. For its affordability and features, this Rosewill case rounds out our list. A good PC case will be with you for a while, and will offer support for multiple hardware upgrades and changes. Each of the cases we’ve highlighted here will keep your components cool and safe while offering plenty of eye-catching features. Our top pick was the NZXT Phantom 410 for its airflow, customization, and great design. However, each of the gaming cases we featured here brings something slightly different to the table, and are sure to provide you with the best PC design of your life. And remember, whilst having extended gaming sessions, you should make sure that you’re protecting your eyes with some proper gaming glasses.